The fall of 2010 marked the start of our first year away from Smith, and we Chapin housemates (and a classmate from Parsons and one from Haven) missed the fast-paced discussions we had grown used to in our classrooms and late at night in Chapin’s dining room. We also found that—for the first time in years—we had time to read for pleasure, and were looking to each other for book recommendations. Because we are spread out across the country, we saw a virtual book club as a great opportunity to stay in touch, as well as to keep some literary discussion in our post-Smith lives. 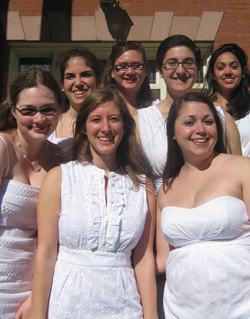 Some Chapin Club Book members on Ivy Day 2010. Front row, left to right: Sarah Campbell, Claire Stein-Ross, Katy Frank. Back row: Yael Langer, Cornelia Treptow, Rachel Sietz and Sarah Bashiruddin. In the first incarnation of the Chapin Book Club, we read the same book at the same time and discussed it via email, which ultimately proved to be difficult given our varied schedules. We decided instead to select three books to read within a six- to eight-week period, giving everyone time to find each selection and finish at her own pace. During each “book round,” we keep a Google document with discussion questions that people add to as they finish each book. As we read, we also have separate email or phone conversations. At the end of each round, we discuss all the books in an email thread as a group. The informality of our book club allows our discussions to feel natural, as though we were still talking over lunch at Smith. Each of us will turn to the others to discuss questions as they come up or as we see the books we read mentioned in the media. Book selection is one of the best parts of the club; we share ideas of books we’ve heard of recently or have been meaning to read for years. And because we all love to read, the list is quite long. We try to balance genres and topics, such as picking one fiction and two nonfiction selections. Often, the books we read have a connection to Smith. Last summer we read Dreaming in French: The Paris Years of Jacqueline Bouvier Kennedy, Susan Sontag, and Angela Davis, by Alice Kaplan, which was also the 2012 summer reading selection for entering students. In our current round, we are reading Drift, by Rachel Maddow, who was our Commencement speaker. Now, three years out of Smith, we all have varied interests and lead very different lives. We are often busy with work, volunteering and graduate school. But the Chapin Book Club brings us together, giving us a consistent way to keep in touch with each other, while the books we read offer us a chance to relax and learn about topics that we may not otherwise have become aware of in our real-world lives. Google can’t replicate a Seelye classroom or Chapin’s dining room, but each new email thread makes all of us grateful for our Smith education and the smart, opinionated Smithies we met as students and continue to grow with as alumnae.